Saturday was another hot, steamy day in Houston and the IZOD IndyCar Series was coming back to the city for the first time since 2007. Not one, but two races. A double header over Saturday and Sunday around the car park that surrounds the Reliant Astrodome, home of the Houston Texans football team. With game demands that also included parking the grass back into the stadium, the IndyCar track could not be put together until last Sunday. That meant just a few days, not a few weeks for construction and alignment. Despite best efforts, track quality was not quite up to spec. A few bumps were found on practice day, Friday, so a temporary chicane was constructed from piled high tyres commanding even more careful attention by the pilots of these high performance vehicles to navigate around a new bend. A lot of grinding happened overnight but the concrete still kicked up some fuss as the cars careered through, still buffeted by its roughness. Two dozen international teams were crowded into the Paddock- a couple of car parking spaces each (this is a parking lot, remember), occupied by IT technicians, mechanics, re-fuelers, wheel changers, fire fighters and more. This truly is a splendid team effort across disciplines and nations. Business can learn a lot from the integration, allocation of duties and speed of delivery that is demanded from pit stops that hopefully last a few seconds. Sadly for Helio Castroneves, Penske Racing team’ s driver, current leader in the IZOD IndyCar series and one of my own favourites (his team is sponsored by Shell and Pennzoil) this was not to be the case. Some major mechanical work around his gearbox held Helio out in the sun, baking hot, Texan-style for nine laps before he could get going again. He finished in 18th place. 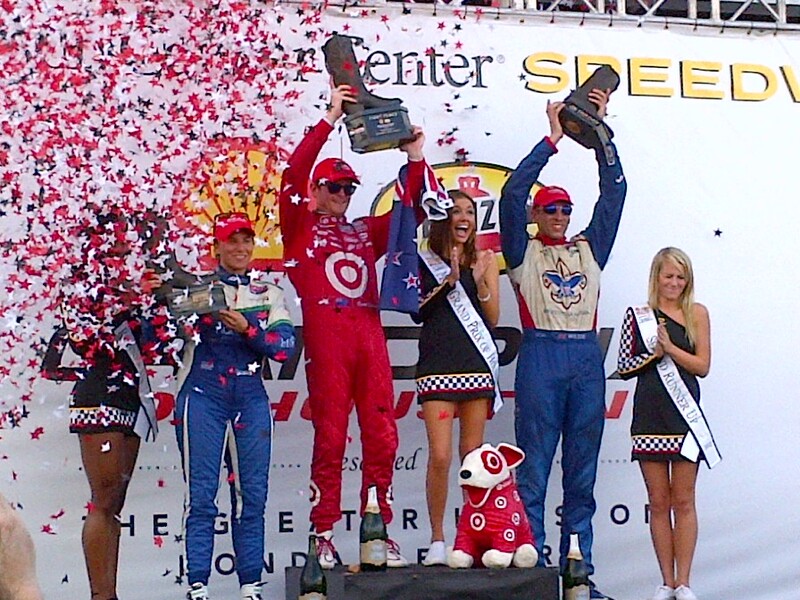 Contender #2 in the season, Scott Dixon from New Zealand, took every advantage he could from Helio’s mechanical misadventures and took the chequered flag. That brings him and Team Target Chip Ganassi Racing within eight points of Helio. Simona de Silvestro, KV Racing Technology took second place, her career best, followed by Brit, Justin Wilson with Dale Coyne Racing making his fourth podium finish of the season. It’s a double header in Houston. They all go again tomorrow. Enjoy it, race fans.